On March 16, 1968, U.S. Army lieutenant William L. Calley’s platoon marched into the South Vietnamese hamlet of My Lai, reputedly a Viet Cong stronghold. In an atrocity recorded by U.S. Army photographers, the platoon massacred 347 unarmed civilians, including women, old men, and children. 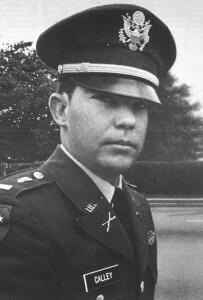 After an army cover-up was exposed by Vietnam veteran Ronald Ridenhour, several soldiers were tried by court martial, of whom only Calley was convicted on March 29, 1971. Many Americans saw My Lai as a microcosm of the Vietnam War, in which U.S. “defenders of democracy” were slaughtering the innocents; others saw Calley as a victim, thrust into a war without clear direction from policy makers. Calley was released in September 1974 after a federal court overturned his conviction.